Mince 2 garlic cloves and combine in a small bowl with oil, 1 tablespoon oregano, 1/2 teaspoon salt and 1/4 teaspoon pepper. 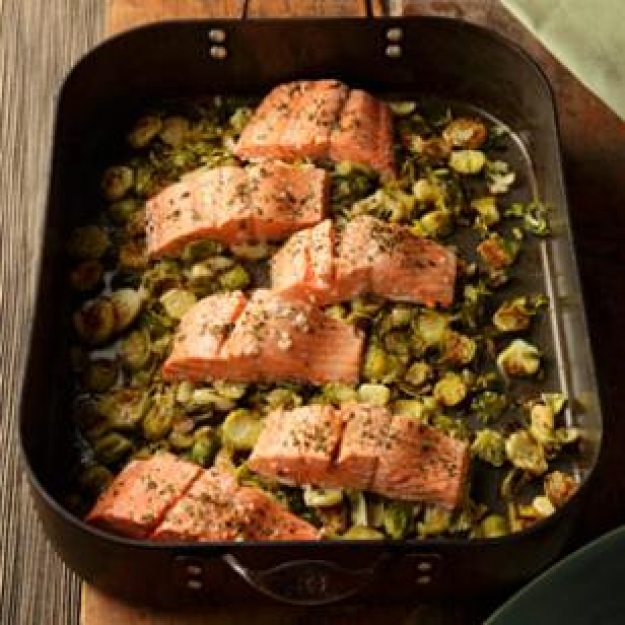 Halve the remaining garlic and toss with Brussels sprouts and 3 tablespoons of the seasoned oil in a large roasting pan. Roast for 15 minutes, stirring once. Add wine to the remaining oil mixture. Remove the pan from oven, stir the vegetables and place salmon on top. Drizzle with the wine mixture. Sprinkle with the remaining 1 tablespoon oregano and 1/2 teaspoon each salt and pepper. Bake until the salmon is just cooked through, 5 to 10 minutes more. Serve with lemon wedges.